They should have gone to Mecca for the bingo! Jesus uses euros, not pounds! Yeah, nice analysis of the win/win apologism that “god” always gets from his followers. No matter how it breaks, it’s always because “god” is good. Right? RIGHT?!?!?111? And Jesus saves; Satan invests. 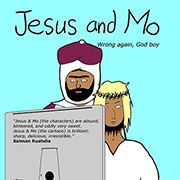 Some of your Jesus and Mo materials will be included in our Journal of Brave Minds. We will underline source and your email address. Keep us informed about your future works. I always think that these comics couldn’t get any better, but they do. Jesus’ last bubble is amazing. God IS a bloody marvel simply because he’s the imaginary-invented-by-people-guy doing all this bloody (literal meaning) mess in this world! Oh, I should start believing in miracles. It is a miracle how something that has nothing to do with reality affect reality that much! God always says the dumbest things! Why do people keep listening to him? He’s obviously just trying to see how stupid we are. For what it’s worth I’ve just convinced our “powers that be” that if you can do it, so should we……. Confront a few small things……. Thanks for this small light of sanity. God, in all his wonder led someone astray? Did anyone take the spread? Gods to seek answers from. 5 to 1 this will be taken the wrong way. 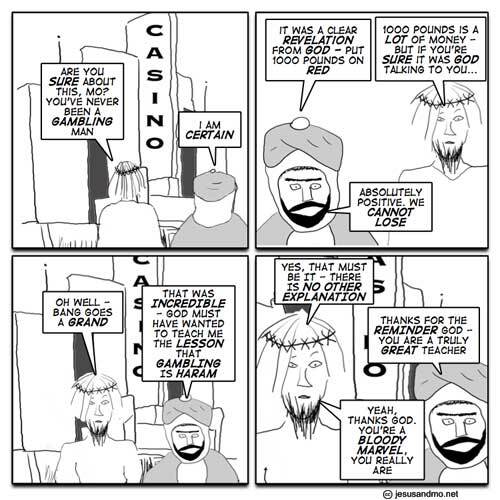 Those machines were altered by Satan for making Jesus and Mo to lose!